HIV has been one of the most devastating and frustratingly difficult virus to tackle. It stuck my attention in a recent talk, that there have been to date nearly 80 different vaccine strategies being tried, ending up as a failure. Treatment options have definitely improved over the years, but nothing that has yet been promising enough for a complete cure. By the end of 2014, studies have concluded that the HIV has most probably toned down its virulence. The latest statistics is not clear. The most recent authentic figures available suggests that by end of 2013, globally nearly 35 million people were living with HIV. HIV life cycle is one of the most seriously studied process. 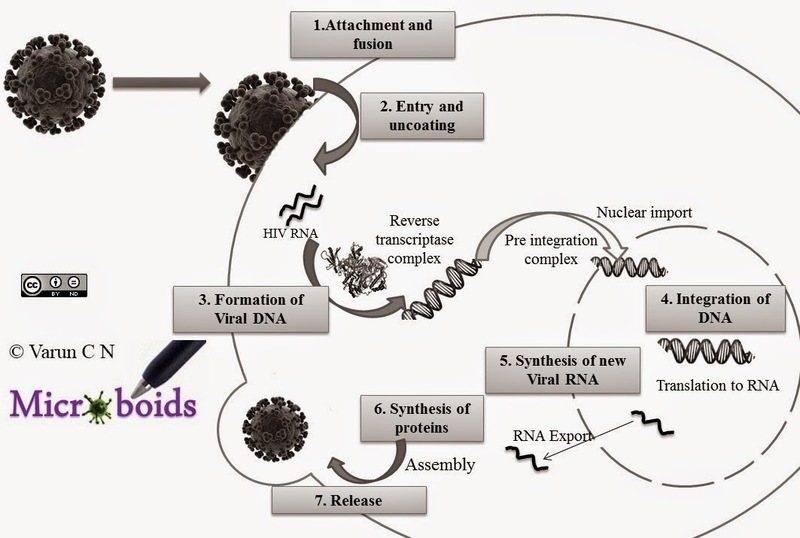 The replication of HIV has 7 major events- (i) Attachment and fusion (ii) Entry & Uncoating (iii) Formation of Viral DNA (iv) Integration of HIV DNA (v) Synthesis of new viral RNA and proteins (vi) Maturation of viral proteins and (vii) Release of infectious virion. DNA integration is a tricky feat. The site where HIV integrates in the genome impacts how HIV replicates in later part of life. HIV doesn't heavily rely on host genome to regulate its genetic process and most of the work is done by TAT (Link). But for the process to start the HIV needs to be in the part of chromosome, where there is enough activity. Studies performed to check the site of integration, showed a variety of hotspots. It is further known from literature that some sites have high probability of integration. The sites are known as HIV recurrent integration genes (RIGs). But analysis of these sites didn't yield any pattern except that these were transcriptionally active regions. This yields a crucial question. How does integrase know where to put the DNA and what determines the molecular preference. The leading opinion was this was a stochastic process, but it soon become clear that this wasn't one. The new paper by Marini etal, seems to have solved the problem, by studying the 3D build of chromatin and its relation to the HIV integration. Table 1: Methods to study Genetic architecture. I need to digress a little bit here. Textbook description of Chromosome organisation is based on the idea of DNA coiling around the histones and subsequent organization. However, nobody had an absolute idea of the structural details, till recent invention of a technique called 3C (Chromosome conformation capture) technique. These techniques have shown that chromatin organisation differs a lot from what the traditional books teach us. The methodology has dramatically been improved which is now known as 4C, 5C and the latest Hi-C technique. Another technique that has been under some consideration is 3D immuno-DNA fluorescence in situ hybridization. The details are available elsewhere. For the time being its enough to know that these methods allow to study the spatial organization of the genetic structure. The paper looked into the spatial arrangement of HIV hotspots integration in CD4+ T cells from both healthy donors and patients infected with the virus. The study yielded that the integration was more common in those regions where there is an open chromatin, which is probably more active region and also more accessible. In addition, majority of them integrated in regions closer to the nuclear periphery. Chromatin structure closer to nuclear membrane is structurally too complex and is divisible into 2 functional types- LADs (Lamin-associated domains) and NPC-PR (Nuclear Pore complex proximal regions). Of the two, the later is associated with transcriptionally active regions. By using ChiP-Seq method, the chromosomes were analyzed for HIV integration sites. As the results would have it, the integration was indeed in the NPC-PR regions. Let me quote the summary from a commentary paper, "According to this model, after entering the nucleus through a nuclear pore, integrase targets the first open chromatin region it encounters, thereby excluding the closed heterochromatin of LADs and the distant chromatin of the nuclear interior". Well that pretty much sums up the whole point. As for the question on why HIV is in such an urgency to integrate to whatever it first see's as open. The authors propose a simple answer in the paper. "This is likely to be related to the short life of viral integrase and thus the need, for the pre-integration complex, to achieve rapid integration into genomic DNA upon its entry into the nucleus".